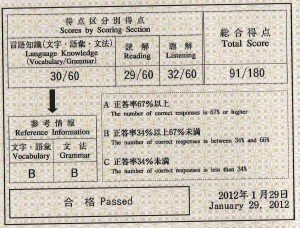 December 2011 JLPT Results are In – Passed N2! Okay, so I’m not really going to brag here, because as you can see, I just barely, by the skin of my teeth passed the test. Just for a little refresher, the score needed to pass the test is different for each level. For N2, you only need 90 points to pass and I got one point above that so yes, very ぎりぎりセーフ. Despite just barely passing, I went through a pretty strenuous study schedule to make it all happen. I think a lot of times in language learning you start to plateau and it usually takes a big challenge, something bigger than you have ever attempted before to knock you out of that lull and keep up your upward progress. The N2 proved to be that big somewhat epic goal that helped knock me out of my lull. You have to definitely take this test seriously if you are hoping to pass. I have known a few people to waltz in and pass the test without breaking too much of a sweat, but for some others like me, it has seemed insurmountable at times (and it isn’t even the most difficult test). Over the last year, I’ve made some significant changes to the way I studied that helped push me up and over this little speed bump on my road to fluency. These are some of the things that took me from a mediocre snail pace of progress to a fast commuter train of progress. We’ve all heard of the wonders of spaced repetition systems, or SRS for short. They are handy little tools that help you remember pretty much anything by reminding of that thing right at about the time you start to forget it. It’s a pretty handy way to lock things in without too much work. I used to use Anki fairly regularly, and I still recommend it because it is customizable and gives you a lot of control over spacing and the interface. You can really tailor it to your needs and the way you like to study, right down to fonts and background colors. It also has a lot of tools available so that you can sync your deck across multiple platforms like iPhone and your PC. But recently I got involved with memrise.com and started helping them organize their courses and improve the service for Japanese learners. Not only has it given me a good insight into the best ways to study vocabulary, it has also helped me to clarify differences in meaning of similar words like 細い and 薄い. Both mean thin, but 細い is used for things with volume, like people, whereas 薄い is more for density and something already flat, like paper or coffee. Memrise.com provides a couple of good features. First, it has a SRS built in so words are shown to you on a set schedule. Second, there is audio (being slowly added) to the courses, so you get audible reinforcement. Third, users can contribute mems, which are mnemonics, pictures, extra info, and even video. These mems help relate the word to information already in your head so that you can remember the vocabulary. Memrise.com is still a work in progress, but the site is getting better and better every day. Hopefully it’ll become a great tool for language learners. Drill books have their place and their uses in preparing for the test. They offer you a great background to the material and fill in any gaps that might need filling in your studies. The New Kanzen Master series is especially useful in this regard. The So-Matome series also has its uses as a good introductory book. If you have the time/money I highly recommend picking up both. But slavishly studying just those books and the vocabulary lists that are prevalent on the web isn’t enough. That might work for N5 and N4 and probably even N3. But at the N2 level, there were a lot of words that I weren’t on any standard lists on the web. And the grammar is sometimes presented in a way that you need to know more than just the meaning and the rules behind it. This means actually getting your hands dirty and diving head first into the language. The reading that I did was a huge boon. Some of the words that I found in the books I read were on the test. These words weren’t in any N2 list either. I just picked them up out of the context of reading the book and plopped them into memrise or Anki to study them. Although some of these words have only limited use, there were a good handful that were lifesavers for the test and I learned them naturally through just reading the book and reviewing them later. This is a lot different from reading an example sentence in a vocab book and then doing some exercises on the word. Also started watching more jDramas and listening to a few native Japanese podcasts as well as Japanese language learning podcasts, mainly Japanesepod101. This helped train my ear for different types of conversational Japanese, giving me a faster response time in the listening section. About a month before the test, I sent a podcast on how to sharpen the sword. Throughout the year, we are building the sword making it big, strong and sturdy, balancing out your Japanese skills. But for the month before the test, I recommend sharpening the sword, fine tuning your grammar, drilling anything that is a little shaky, and doing some kind of test taking practice every day. This process reinforces what you know to the point that you can quickly answer questions about it confidently. The N2 doesn’t allow for much thinking time, you have to trust your instincts and answer fairly quickly to get through it and pass. You don’t have time to think about grammar rules and working anything out in your head. You have to answer and you have to answer fast. Doing all sorts of drills from reading to listening, from grammar to vocabulary, helps train the brain for success. Is this good for your overall Japanese studies? Well, not entirely. You are doing some extra work that is only going to pay off on the test, but there are some other skills like reading fast and grammar accuracy that will make you more professional and your life a lot easier when you use Japanese. I know a lot of you took the test in December. I’d like to hear about your results and your reactions. What did you do to help you get a higher score? What did you do that didn’t help you get a higher score? I’d love to hear about it and I’m sure everybody else would too, so let us know in the comments! Yeah, that’s all that matters sometimes right? How about you? Thanks Sarah! Hope your studying is going well! I live in Argentina and my sensei told me results will be in March. So I’ll have to wait until then to see if I passed N4. If I dont get a good score at N4 I’ll probably retake the test this December. Are you going to aim for N1 now? or are you re-taking N2 again? I’ve been thinking about that, Virginia. I’m not sure yet, I know I can’t pass N1, but it would be good experience. I’m bit scared to re-take N2, because I might fail, haha, but it might also be good motivation to keep me studying hard. I have some other projects I have to work on, including improvements to this site, so I’ll be pretty busy. I’m publishing a podcast this Wednesday that details my plan for going forward, so stay tuned! Still another month before the results arrive in Europe (-.-‘). I’m already studying for N2, though =). I plan on finishing N3 material by summer and get on with N2 in time to at least get a passing grade in December. So I don’t care if I passed/failed N4, I won’t let it get in the way of my goal =). Yeah, I bet it is painful to wait for your results. We used to have to do that here in Japan as well, it seemed like just about the time you forget about the test is when you get the results. Don’t let it hold you up though. Keep going strong! Hi, I’m from the Czech republic and the results are already here. I passed only N5. But I’m still very happy. Congrats to all who have passed!!! N5 is still a pretty tough test, especially for those outside the country. That’s great progress. Are you going to do N4 next year? I would like to go. I love Japanese 🙂 It’s a beautiful language. PS: thanx for the compliment and thank you VERY MUCH for your pages. It’s a great help not only with japanese, but also with English!! Like you, i barely passed by 3 points, it was my first attempt though, so very happy. Surprisingly i fared better at reading, geting 39 out if 60. Most of my daily study involves reading normal books, not much grammar. I was preparing with some old test format materiald and found the new test much harder. Yeah, I usually come pretty close to ace-ing any of the old tests, which makes the N2 so much more frustrating. I’ve switched to doing a lot of reading as well. I think that will probably be my main focus for the N1. I’ll be doing a lot of reading and practicing vocabulary from my reading and using the drill books to sharpen up before I go into the exam. Much better than last time, although I did terrible with the listening. This test has been a big focus of mine for the past two or three years so it feels great to have reached my goal. Mac, will you be taking N1 in July? Wow! That’s an impressive score on the N1! I wouldn’t feel too bad about the listening score. It must be pretty difficult. I can’t imagine what the N1 listening is like. Personally, I’d recommend waiting until December to take the N1 to give you ample time to start digesting the new grammar and vocab. In my case, I waited a full year before taking the N1 after I passed N2, but failed it by two points, then passed it (this time) on my second try, so it was a year-and-a-half after my N2 pass that I got N1. I know other people have done it a lot faster, but I’m not much of a test-taker. All right, thanks for the advice. I wouldn’t short change yourself too much. You say you are not much of a test-taker, but that is one heck of a score. Any pointers as to what you thought was the most effective? Everyone is different of course, but what worked for me in passing N1 was daily SRS (500 words a day was my average), reading novels, and drilling as many study books as possible. I had 2 or 3 different books per section and went through each of them about 3 times each. Of all of my books, I found the new Kanzen Master reading book the most beneficial. The last month or two leading up to the test I was able to do about 3 or 4 hours of studying a day, but not everyone has that kind of free time. Good luck! Wow, congratulations! I’m sure you put a lot of hard work into it. I’m studying for the N3 this year, I haven’t taken the test before but I think if I work hard I’ll be able to make it. I’ve been following your blog for a since the beginning of the year and you’ve provided a lot of help and advice, so thank you for that. Are you studying here in Japan or in another country? I wish you the best of luck on passing N3. Are you taking it in July or December? I’m in the United States. I wish I could be in Japan, but I haven’t quite made it there yet. I’ll be taking it in December, which hopefully will give me enough time to feel confident with the material. Congrats Mac! Good to know that you passed. I passed too, got a total of 96/180. Not really pretty too but I’m very happy with it! My reading score is not good so I’m planning to do more reading & I just bought the Itoi shimbun book that you recommended. Your site really gave me a lot of tips for passing N2. Thanks heaps! How are you doing with the book so far? I think some of the essays are really difficult while others are so-so. Thanks, I can’t believe I finally did it to be honest! Just received the results in England for N2, I also barely passed ! It was my first time with N2 I barely passed N3 in December 2010. Any way my scores were Language knowledge 30/60, Reading 29/60 and listening 34/60 (I stopped watching English TV over a year ago and only watch Japanese Satellite TV and that helped a lot) , total 93/180. When I was practicing on the old JLPT 2 style papers a few weeks before the exam I kept getting borderline fail marks but felt that the old JLPT 2 style seemed more straight forward. Any how its going to be a while before I attempt N1 because my reading is rubbish. Good Luck with your studies. That’s pretty good. Have you spent any time in Japan? Passing the N2 while you are outside of Japan is very respectable. Watching Japanese TV was probably a big boost for you. I try to watch as much as I can. It’s still pretty tricky for me to pick up on the colloquialisms they use, but it definitely gets your ears ready to listen and understand Japanese at full native speed. I agree with you on the old JLPT. It was a pretty clear cut test and somewhat easier to study for. The biggest complaint people had about it was that it wasn’t very practical. So that is why they made this new more practical test. It’s more difficult, but more useful I think. Congrats on passing, うらやましい! I have attempted the N3 last July missed out by a 7 to be exact, so I thought I could some how manage the same in N2 in December but I fell flat on my face. I haven’t received my results yet but it dont matter the fact remains I dont know enough and I’m working on that. The N2 seems to be a bit higher level than the older version with a lot of unfamiliar vocab as you mentioned in your blog post, I’m currently working on my vocab and reading. Yeah, the N2 is not equivalent to the 二級. The N2 is more like a 準一級 (pre-一級）. They added more difficult kanji and vocabulary and are testing more for nuances and small shades of meaning more than just the meaning. Good luck on the test in July! O well July is there . .
That’s terrible Anu. But, you WILL pass in July I think. Awesome Shailee! Let’s go for N1! Congratulations! You worked so hard to pass! Results for Germany (here: Hamburg) came on Saturday and – I passed N5 on my first attempt. It must have been a very close shave, I still can’t believe it. My difficulties were the reading speed, especially in the grammar- and reading-section. Suddenly the tutor told us “twenty minutes to go” and there was a lot of unread text left …. So I will work on reading speed and try to learn the vocab constantly till I hopefully have time to take the next summer course at Hamburg University. Keep sharing your experience and thank you for your support. Reading always seems to be tough. I think it’s because we don’t usually do a lot of reading in Japanese class, just a lot of speaking. Congrats on passing the N5! It might be the first step, but it is still a tough test. Hey Mac..Many Congratulations!!! I too passed N3. This truly gives me lot ot motivation and enthusiasm to sit for N2 this July. Am reading your blog regularly and your blog am sure would have been helpful to many like me. Thanks a lot for keeping this site up with regular updates. 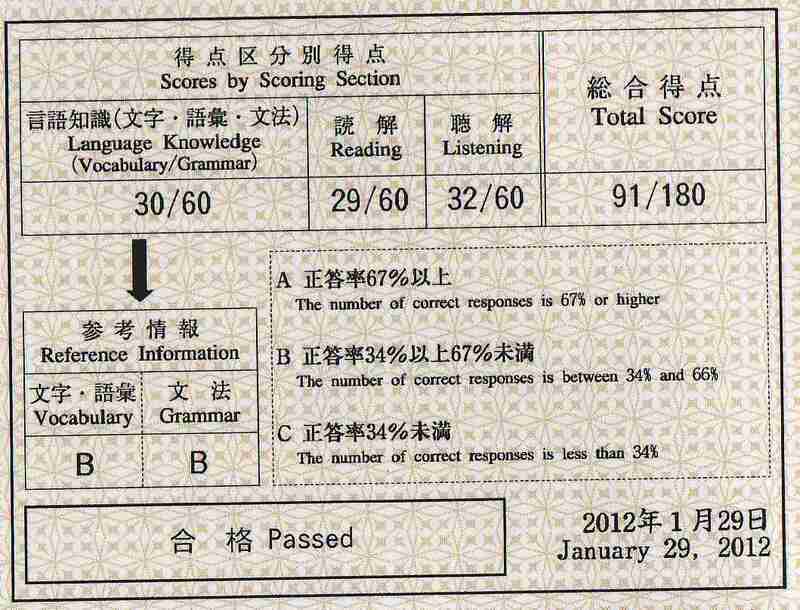 Here are my scores: Kanji/vocab = 53/60; Grammar 35/60 and Listening 42/60. Total is 130/180. Still a pretty good score Viji! 130/180 is great. Be careful with the grammar, that might be problem in the future. I’d recommend doing some extra grammar study for the N2. The grammar points get pretty tough at that level. It’s not as clear cut as N3 grammar. Here in Ukraine we still waiting for results for my N4. They just created a featured N3 deck on the site. It is still a bit buggy, but we are working on it, and it should be very accurate very soon. They are actively editing and moderating the N5, N4, N3 and N2 courses at the moment. They are really starting to clean up. Congrats Mac! Passing is passing. It is going to be three years studying Japanese on my own for me this April. In December 2010 I got lucky to pass N2 with a 107 or 108 I think. I took the N1 this past December for the first time and failed w/ a 79. I got. 37 on 文字、語彙、文法. A 12 in 読解 which cost me the test, and a 30 in listening (the N1 listening this time was harder for me than the practice tests). The reading on the practice tests was hit or miss. I got high scores sometimes and other times bombed it like I did on the real thing. I can’t take it this summer so I’ll take it again in December. The long wait..
I’ve studied kanji via ssr on https://www.kanji.koohii.com along w/ James Heisig’s book Remembering the kanji. I started that in Jan 2010 and highly recommend it. Love his book but only in combination w/ the ssr site listed above. I studied grammar this time with Sou-matome and it was ok.
My vocab will get better. Gonna do a little bit of review and do more reading for fun. The test being timed is what can bring down my reading scores so badly. Nothing to be ashamed of though and actually welcome the test again as a motivator and place marker to keep studying. Mac, Thanks for your enjoyable podcasts. I just started memrise a week ago and love it. Couldnt believe someone already made a deck for a vocab book i was studying!! Practice (in any way) makes perfect. oh and my advice is if you don’t mind spending the time and money Mac, take the test this summer just for experience. Even if you fail it gives you an idea what to expect in December and…maybe you could pass! N1 and N2 are much much harder than the old versions which is why the points required to pass was lowered too. I was thinking about taking the July test for experience and just see what happened. I have hard time imagining how difficult it is. I’m already (slowly) making my through literature and I can usually at least grasp what is going on in a tv show. I know I’m not there yet. But its thrilling to feel so close to the ultimate goal. I already started my study routine, but it is a little slow going at first. I got a similar score to you Andrew. 81 total: chishiki 35, reading 15, listening 31. I was a little disappointed because in my practice tests I was getting 120-130 towards the end. On the other hand, I realised I shouldn’t have expected to pass it first go. My grammar/vocab score was only slightly lower than what I was getting in practice. I guess I have to drill more words in (I didn’t study seriously until 1 or 2 months before, really not enough time to cram it all in). Reading was an abysmal failure, this time around I’m gonna stick to reading books and newspapers and testing my comprehension on them. Looking at everyone’s comments here, it seems listening was a little hard this time around. I personally remember my brain checking out during the short response questions. Especially since you’re working like me, Mac, and not used to taking tests all year round like a student, I recommend you take the N1 in July even if you don’t think you can pass it. It’ll at least harden you up for the next time and give you a feel for what the test really is like (the real thing feels quite different from all the mock exams). I’ll be taking it again in July, gambarimasho! Thanks for the advice Dotto. I think I’ll be heading in to take the N1 this summer and see what it is like. This weekend, I’d like to do a little bit of shopping for new books. I’ll probably be buying a new book every month from now on to get all that N1 stuff in my head. It doesn’t look too bad so far. A lot of the vocabulary looks pretty straightforward really. Just have to remember it all. I passed too, although I’m not very happy with my score. Passing is passing right? Congratulations! Yeah!!! Results came out in the UK today. I know many people here are so much better than me but I’ve just passed N5 and am very happy 🙂 I didn’t have a teacher or take any real lessons (except the N5 prep tests at JOI) so I was self-taught. I still think the listening is my main focus and am working like crazy for the N4. I’ll probably do it in December – want to sort out the listening stuff as well as secure the vocab. The N5 is a good start though. My readers seem to be evenly balanced between the 5 tests, so you are not alone. It’s great that you did it self-taught too! You’ve taken the first step, which is the most difficult part. I’m sure if you keep your studies up and on schedule, you’ll be able to make N4 next year. Congrats on passing N2! I’ve been studying Japanese off and on for a long time, but only got really serious in the last 4 years or so. I passed N4 in 2010 and was happy to pass N3 in 2011. I’m aiming for N2 in December (we only get to take the test once a year in LA). Thanks for all the recommendations on study material. I’m loving the Shin-Kanzen series. For kanji, I’ve found all those kanji games on the Nintendo DS to be great. I’m currently juggling a couple of non-fiction books and I’m trying to listen to as much Japanese programming as I can, but my listening comprehension is still not very good. Any recommendations, or is it just a matter of putting in enough time? Also, any tips on remembering vocabulary? I have a lot of Anki decks, but it seems I forget all the old words whenever I learn new words. For improving your listening comprehension, have you tried the shinkanzen N2 book? It has a lot of strategies that pertain to listening for the test. For more general listening practice, I would recommend doing some listening reading. This basically involves you reading a script while listening to the CD play back. You can do this with the kanzen book, Japanesepod101 podcasts, or any other listening material for that matter. As for remembering vocabulary, Anki decks are great of course, but if you want to try something different I always recommend memrise.com. If you have a feeling that old words are falling out, that’s where doing a lot of reading/listening will keep them in. The main reason why stuff falls out of your head is because your mind has decided it’s not important, so if you are exposed to it in a meaningful way (ie. reading or listening something you are interested in) it will generally stick a lot better than a huge list of words you go through, even if it is SRS. lol I also got 91/180 on N2 this year, but didn’t pass. You seem pretty well-rounded. My score shows some obvious strengths/weaknesses, but it all just boils down to needing to focus on kanji and put in a good amount of study time for me. Either way, aside from not being able to put N2 on my resume yet, I’m pretty happy with my score. It’s better than I thought I would do, and it just means that this year I need to put some time and effort into studying a little each day. Who knows, maybe I’ll go all the way and take N1 this December (and fail by 1 point? lol). Ouch, that must be a little painful. You have amazing listening comprehension though. Do you watch a lot of Japanese TV? Is there anything in particular you do to get that score that high? It seems like vocabulary is a weakness of yours, which is a little interesting to me. Do you do a lot of work with Anki? or just a lot of reading? I always tend to be pretty balanced, I don’t really do it on purpose, it just seems to happen. Haha, it’s alright. Like I said, I’m pretty happy I even came this close to passing. I’ve always been pretty strong with listening from watching Japanese TV, but I also went to school in Tokyo for two years so that helped a lot too (though I was constantly surrounded by English lol). Before the test I really didn’t have much of a daily study routine, and that’s what hurt me most in the other sections. But I did study twice per week with my former Japanese teacher, and we worked through some of kanzen master, so-matome, and various other articles. Without that I most definitely would have failed the reading section too. I’m hoping to go back to Japan soon after I graduate this semester, so I’m really starting to put more focus on studying Japanese recently. Being as kanji is my biggest weakness, I started doing Remembering the kanji and it really seems to be helping even though I already have a grasp on a good amount already. I used Anki a bit back when I studied for the old 4 and 3 years ago, so I’m also going to start that back up because my vocabulary definitely needs a boost. I also just checked out Memrise and it looks great, so I might end up incorporating that into my study routine, too. Thanks dude! And great job with the site. Mac, thanks a lot to you. Cause when i first time entered your site i download your book about “5 mistakes”. It was 4 week before the test. And its help me a LOT…. Wow, 10 months of self-study and you passed N4? Excellent work! You must have been studying hard. Now, on to N3! or N2? Just got my results today for the N4 and I PASSED! Considering I didn’t really buckle down until after I applied for the test in the September, and it was my first time taking it EVER, I did pretty well. I made a 99/180, which is okay. I thought I did better than that, but I guess I underestimated how hard the test was. In my experience, you can never guess what you are going to get on a test. I’ve thought I aced a section and it’ll turn out to be my worst section. おめでとう！！！！　本当におめでとう！！＾＾ i wish i was there already 🙂 I just started studying for N3 in July and I was hoping to being able to pass N2 in december…just the kanji alone though seem to be unmanagebly many 🙂 and all the extra work you did besides the workbooks..holy 🙂 where do i take all that time 🙂 how many hours would you say you studyied every day for passing N2 ? I spent about two hours a day studying Japanese. I still spending about an hour and some change a day to keep it up. Also, I have a lot of exposure to it at work and out and about of course. The key is trying to manage your time very efficiently. You’d be surprised how much time you have. Good luck with N3 and N2! omedetou! yatta! my n2 result is due this upcoming (raishuu) week perhaps, courtesy of our instructor. shippai ka, tabun. I hope you pass. Either way, you’ll at least have some feedback to help you set your new study goals. 61 comments! You’re probably tired, but I shall make that a 62. N2 isn’t as difficult as you think. It just requires a lot better reading skills as well as some pretty good listening skills I think. That is where good test taking strategy comes in. If you start now with the vocabulary and try to absorb as much as you can, I’m sure getting N2 is achievable in at least 2 years. If you study semi-intensively (an hour a day?) it might be possible to get it done in a year. I think a healthy diet and regular exercise helps you do a lot of things. I personally just walk to the station every day (30 minutes one way), gets the blood pumping and that helps you use your brain. Anyway good luck on N2! You came halfway, might as well finish right? Congratulations, I passed N2 too, with 97/180. Not a good result I know, and I barely made it with 19/60 in the Grammar/Vocabulary section. I got 45/60 in Reading section and 33/60 with Listening. I just got the results today in Vietnam. Even though the mark’s not high, I have to say it’s higher than I expected. I thought I would fail for sure, consider how hard the test was. It was really more difficult than I participated. I started studying Japanese day and night since July, 2010, then took about 4 months off. Then I started preparing for the N4 test and studying Chinese at the same time. I took the N4 test in July 2011, and passed with 151/180. I skipped went N3 straight to the N2 test, knowing it would be difficult, ‘coz I wanted to challenge myself. I stopped studying Chinese and spent the whole time reading Japanese books and listening to podcasts, doing past N2 tests. By the time of the test (last December), I had been studying Japanese for roughly a year. After the test I really regretted that I should have chosen N3 instead, but again I wanted to challenge myself, to see how far I’ve gone with my studying. I couldn’t believe it when I look at the result today, but I have to say I was really lucky too. I know I did terribly in the Vocabulary / Grammar section, and I indeed nearly failed (19/60!). Still I’m very happy with this, it’s the result of my one year studying really really hard, like eating, sleeping, living with Japanese! Now I’m wondering if I should go ahead with N1 this July, or focus mainly on Chinese (the Chinese Language Proficiency test I’m planning to take is around June). I know the chance of me passing N1 in a few months would be impossible, but hey, it wouldn’t hurt to challenge yourself again, right? My dream is to study in Japan, and I’ll try my best to make it come true! Wow! That is an incredible reading score. I lot of people have trouble with reading. The score is usually switched around, higher in vocabulary and grammar and lower in reading. Do you do any regular vocabulary practice with Anki or memrise? Do you do a lot of reading to get that score? I’m amazed. You should definitely keep going. Try for the ultimate goal of N1! I’m sure it’s possible. I most probably won’t pass the N4, but I’m gonna give self-study another chance (I can’t afford classes, nor do I like studying by timetables and schedules). Let’s see if July 2012 is good for me. The test is pass/fail so I say, pass you did, and that is all that matters right? You might want to think about firming up a few holes in your language skills, but other than that I say go for N4 and see where it takes you. You don’t need structured classes per se, but you do need some exposure to ‘natives’. I was always self-taught, but I did have plenty of help from tutors and natives that I worked with. I’m relentlessly asking them questions about everything. I finally got my results. I passed N5 and am sooooooo happy!!! I was scared that I wasn’t good at the listening section but I guess the results are okay. I’ll take my time with the next test and plan on taking N4 in December 2013. I hope that gives me enough time to study. In 2013? I’d say with a score like that you can aim for 2012 with a little hard work. As long as you keep your studies up and at a good pace. It shouldn’t be to tricky. I’m already studying the Kanji and grammar for N4 while also learning for Japanese classes. I’ll just keep going like I do at the moment and see how I feel about taking the test earlier in the summer. But thanks for your confidence. Congratulations! My husband took the N2 and got an 89! He was so upset to find out that he only missed it by 1 point!!! He took it last year and missed it by 12 though so I guess it still means he has improved. He WILL pass it this year! I know he will! One point?!?! OMG, that’s just mean!!! I know it might not be a real comfort but like you said, he has improved and I know he will pass next time! That’s got to be so frustrating. I think that would make me absolutely bonkers. Well, now he knows he can do it, he just needs to put in a little more study time. Well, it is different for each region, but in general if you registered via the internet, then you will be able to see your results via the internet. Otherwise, you have to wait for the results to be mailed to you, which should be around Sep 3 or as late as the 7th depending on where you live. I wanted to ask something regarding the N2 listening part. Since I can’t afford Kanzen master I’m basically throwing blanks as to what the actual level will be. Do they speak really fast, or is it at a normal pace, with the intentional word twists upping the difficulty? Since you use Japanesepod101, what would you say is the best level for N2? Would the Intermediate series suffice, or should I aim for their advanced series if I hope to have a chance at it? (When it comes to the speed and complexity they use in their dialogues, I mean). That should give you an idea of what the speed is like. For Jpod101, I think the intermediate to upper intermediate levels are closest to N2. The Advanced Blog series is very similar to some things on N1. The test though has some pretty tricky listening that is quite different than Jpod101’s style. Jpod101 is trying to be as helpful and as natural as possible so you learn. Whereas the test will be packed with ambiguity and listening that is full of tricks. I know about the practice tests, but given past experience (the N4 listening on the practice test was slower and way less convoluted than the exam listening) I thought I should ask someone who went to the actual exam :). I don’t think there’s any way to work around the convolution, but I want to at least be able to understand what they’re saying; if they’re talking faster than I can normally follow I won’t even catch the main idea, not to mention the tricky correct answer. I think for N2 and definitely for N1 it really comes down to what you are used to listening to. Sometimes they will have topics that you are really comfortable with and sometimes they don’t. If you can get your hands on some of the old tests, they are about the same level as well.